Haven't hunted as regularly as I normally do, but helped some randoms out with a few Rathian quests, killed the 2nd Pink Rathian by hammering her out of the air, (Mid air kill by me, and epic badass moment) then went to a friend and did some turns, sadly my internet has been tempermental and kept disconnecting, so I changed over to Skyrim and played that instead. and a few other miscellaneous upgrades. I need like 5 mantles of each rath, yay! When I told him about considering the Lucent Narga long sword, he decided we should try the event quest, "Sight Unseen," which ended with him carting three times and me saying we ought to wait on the Lucent hunting... Apparantly I did unusually well, especially considering how long we lasted and I was able to not cart and do some good damage. lol soloing a high rank Jhen isn't all that hard - I'm sure the sturdy fang+ is high rank, just good timing of the ship utilities is all you need, apart from breaking both tusks for a higher chance, but I can understand if you think it's a boring and tedious hunt. I still have over half (I think) of my gold crown bigs to go, but I already got my giant pickle gold crown! well,finally cleared the last village urgent...now im going to resupply my farm goods and then head out to grind hr port in hopes of achieving g-rank,going to use my trusty brachy gl and my levin acrus and get up to guran...gonna be a long week. 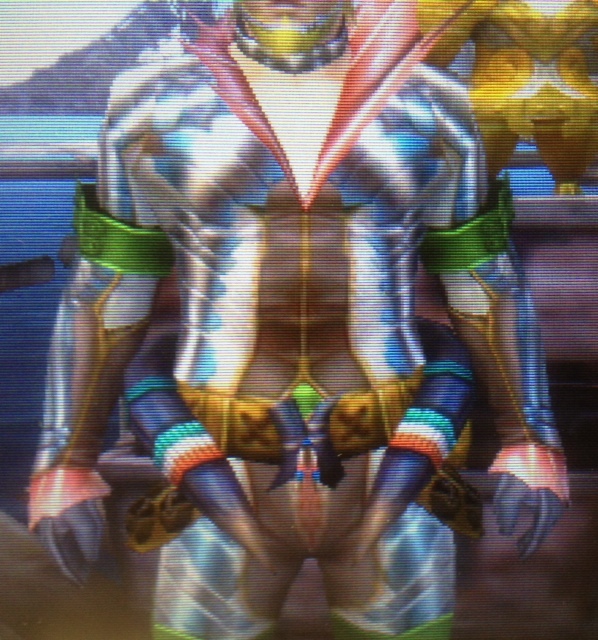 Male Dober armor is completely disturbing. Male dober waist, Plesi legs and chest and Chakra head!!!! only way to go! You should get your brother to make an adrenaline set that also has bonus shot and elemental atk up/dragon atk +2. Then use the Willuminator and spam those Dragon shots into it's face. Although it isn't quite a spam. You shoot a shot (Along with everyone else who has the gun) and it should flip over onto it's back. Then you can shoot another shot while it's flipped over, then wait till it flips right side up, and shoot anotther shot. When done right, it gets locked into a "stun" and can't get out. If you only play with two players, you'll most likely need a very awesome set with attack up and stuff, or else an adrenaline set. Otherwise you won't do enough damage to flip it (Or at least, you won't inflict as much damage, making it that much harder to flip it over). Also, if you don't have a Dire Miralis Gem or something for the Willuminator, make a pierce bowgun set and pierce it (Assuming you can get your brother to make one and pierce it with you). Well.. Starting tomorrow I will have 12 days off work from the 21st to the 5th of january.... so im only actually working 4 days out of the next 2 weeks.. MH3U time here I come!!! Scratched 20 minutes, 1 cart, didn't use all my potions. Not half bad rust-wise considering I couldn't even complete the quest before. Been playing allot of MH past 2 days now..shame i spend more time trying to find a decent group than i do actually hunting monsters. With all the hunting my brother and I did yesterday, I had a great time on MH3U! He needed some materials, so we did "Ivory Indignation," which turned out to be a lot easier to win than the last time we did it, which was a while ago. No carts on this one. He needed a Lagia horn+, so we did a high rank Lagia quest, "The Fisherman's Fiend," since wounding the head on a high rank one seems to be the best way to do it, from the site I've been using for this. No carts occurred, though this was far from surprising, since it was, after all, high rank. He wanted to try "A Father and Son Outing," which he had never completed before, so I tried to convince him to assist me in taking out the big guy, saying that the little one's easy enough to solo, but he kept aiming for the little one and carted three times because of the big one. After he switched to the Kelbi bow, we made an amazingly quick round of both the Jhen Moran and the H. Jhen, which allowed me to forge the Yi Duan, so that's now fully upgraded. We were going to try Alatreon, since he still hasn't defeated one, but our mom called him down to cook something, so we had to abandon only a few minutes into the quest and never got to it... For the first time since I unlocked the Ala, I was actually eager and ready to fight it... Still hoping to do so with him.